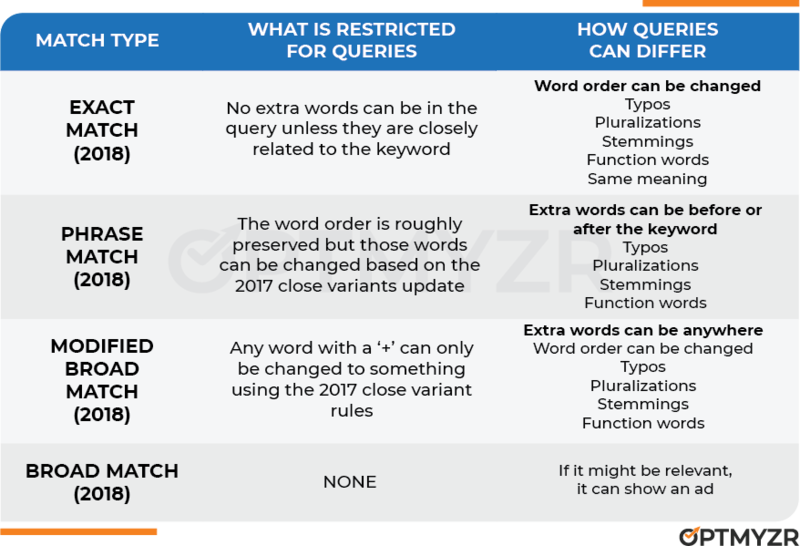 Google changed how Close Variants work and now exact match keywords may also show an ad when Google believes the meaning of the search is the same as the keyword. Kind of like a synonym, but potentially even broader. So here's a script you can use to see exactly what Google considers to be a 'close variant'. The script pulls all queries that were triggered by close variants. It also pulls the associated keyword. It joins the query and keyword and then puts the data on a spreadsheet. On the spreadsheet, you can see line by line what the keyword is and what the close variant is. 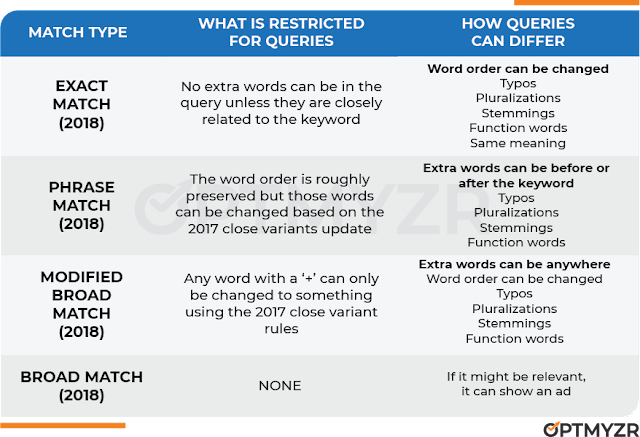 If you want, you can compare metrics to decide if a close variant that seems a little odd may actually be outperforming the keyword. I thought it'd also be interesting to add an automatic way to see how close the query is to the keyword. Whereas going from the keyword [optmyzr] to 'opmyzr' seems like a definite good case of a close variant because it's a simple typo in a brand name, going from [campsites in yosemite] to 'campgrounds yosemite' may be too much of a stretch from the original keyword. To calculate the similarity of the close variant to the keyword, I found an algorithm for the Levenshtein distance which counts the number of characters that must be deleted, edited or added to go from one string to another string. A big number in the Levenshtein column means the query is more different from the keyword. Grab the code below to try it in your Google Ads account. I've also included a table showing how match types work after the change from Google and a video that goes through using the script in case anyone is just getting their feet wet with scripts. I've written several free scripts that export AdWords data to a Google spreadsheet but the one I'll share below does something a little more and pivots the reports so that segment data shows up in columns rather than rows. Here's what the typical output from an AdWords report looks like if you use a script like this one to add it in a Google sheet. 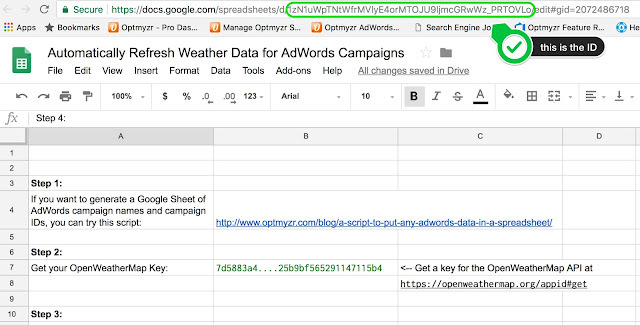 AdWords report data that was automatically added to a Google spreadsheet. The report contains keyword conversion data segmented by conversion type name and day of week, resulting in multiple rows of data for each keyword. I highlighted the cells for the same keyword ID in green so that you can easily see that there are 7 rows of data for the same keyword. Each row has different values for the segments 'ConversionType' and 'DayOfWeek'. Here's why I don't like getting my reports this way... In a typical AdWords optimization, I might evaluate a keyword to see if it meets certain criteria, and when it does, change the bid. For example, for keywords with more than 5 total "Sign Up" conversions, and at least 2 of those conversions on today's day of the week, I might raise the bid. This is not easy to do with the spreadsheet above because I can't simply build a formula for each row as that would ignore the data from the other 6 rows about the same entity. AdWords report data that is aggregated by entities. 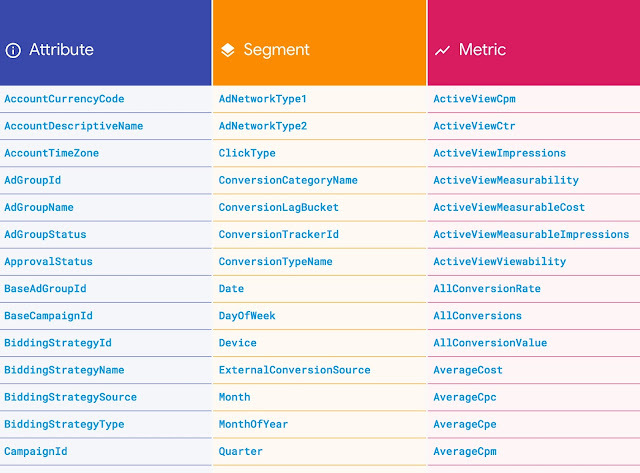 Here there is one row for every keyword along with one column for every combination of metrics and segments. Now you can see there is only 1 row for that same keyword ID as before (highlighted in green). Now I can write a spreadsheet formula that has access to all the elements I need on one row. To get the spreadsheet output in the format I wanted, I wrote a script that finds all possible values for the included segments and then combines this with the different metrics. For example, possible values for the DayOfWeek segment are 'Monday', 'Tuesday', 'Wednesday', etc. Combining this with my metrics, I get Monday.Conversions, Monday.AllConversions, etc. Each of these is then treated as a column in the sheet. So now I can more easily do my optimization. I could also feed this sheet into a tool like Optmyzr's Rule Engine so that I could start automating account management based on factors like day of week, type of conversion, or any other segment I include on the sheet. Optmyzr is my company and also runs this blog. metrics: the AdWords reporting metrics to include. spreadsheetUrl: the Url of the Google spreadsheet that this script will update. tabName: the name of the sheet (tab) in the spreadsheet that should be updated. 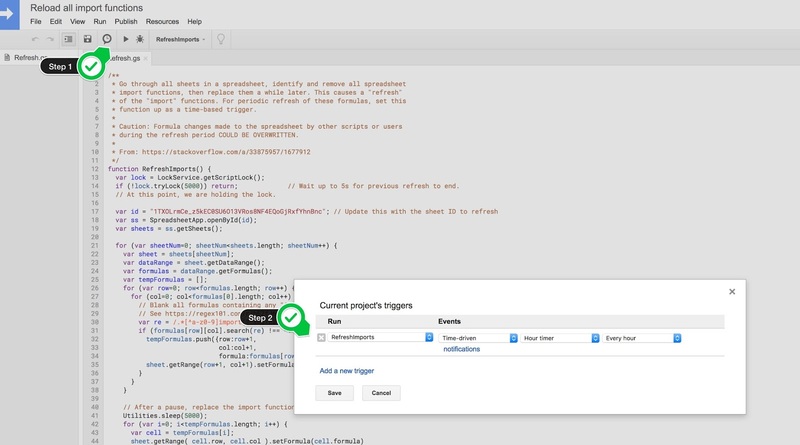 reportVersion: the version of the AdWords API reports you’re using. The data available in the Ads API changes periodically so this ensures our script talks to the right version of AdWords. https://developers.google.com/adwords/api/docs/appendix/reports/keywords-performance-report. As you can see, Google makes it really easy to see what are attributes vs. segments vs metrics. Just be sure to populate the right settings in the script based on what type of data you're adding. Here is the full list of all AdWords reports with the available attributes, segments, and metrics to help you create correct settings. 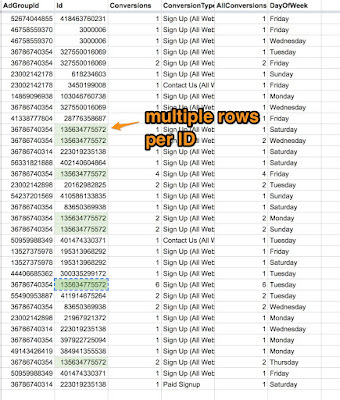 Note that in the resulting spreadsheet, you can't total up the numbers across a row because metrics are included multiple times, once per included segment. For example, in a report with the 2 segments DayOfWeek and ConversionType, if a keyword has 10 conversions, then the sum of all the conversion columns for that row will be 20 (10 conversions * 2 segments). Last June I wrote a script that makes it super easy to do custom data pulls from AdWords and put the data in a spreadsheet so I was happy to hear people still talking about this script at SMX West in March. 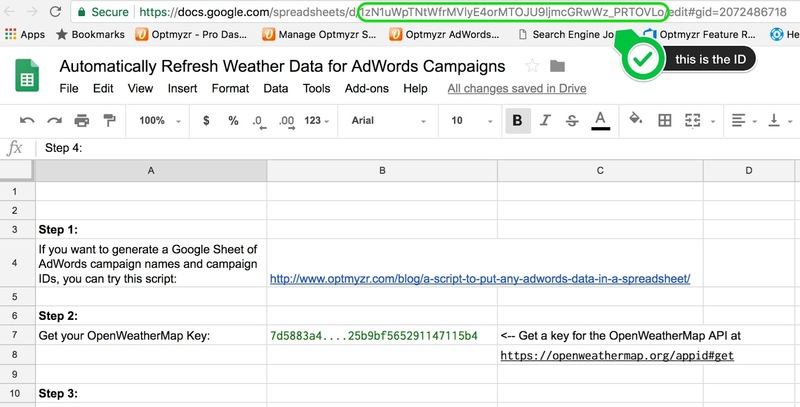 You can find it on Search Engine Land if you're looking for more options to get AdWords data in spreadsheets without paying someone for it. If you've started using Google's Draft and Experiment campaigns, you may have noticed some odd behavior with scripts. We were getting these campaigns back in our selectors, even if they were no longer active experiments. And if we tried to change their status to 'ended', we couldn't do so. I'll explain the similarities and differences so that hopefully you can avoid some of the frustration I faced when we started using experiments in AdWords and some scripts started to break. As you can see, there are situations where some of these oddities can lead to issues. 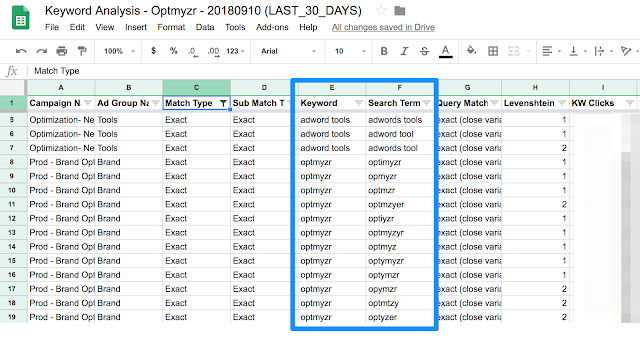 For example, if you have a script that pauses any campaigns that have exceeded a certain budget for the month (like those that Optmyzr provides), the script will recognize that an experiment campaign has spent too much but it will be unable to label it or pause it. The cool trick I learned here is that you can use conditions that are not documented in the AdWords Scripts reference. You just refer to the fields in the corresponding API report and try adding them to selectors. Thanks to Alex from the Google team for pointing this out.